Being a fan of Mopar muscle cars, I always wanted to add a Dodge Demon to my collection of models. 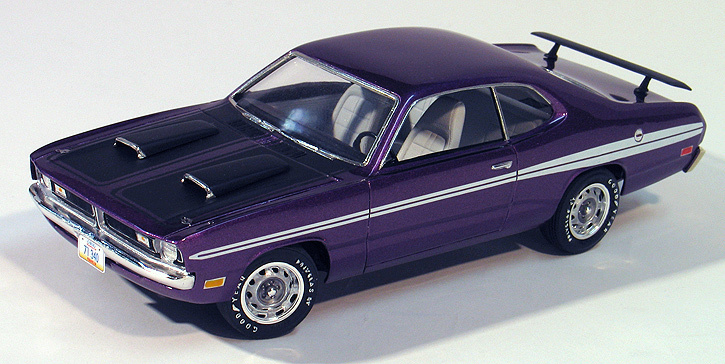 MPC originally offered a 1971 Dodge Demon kit back when the real car was new. 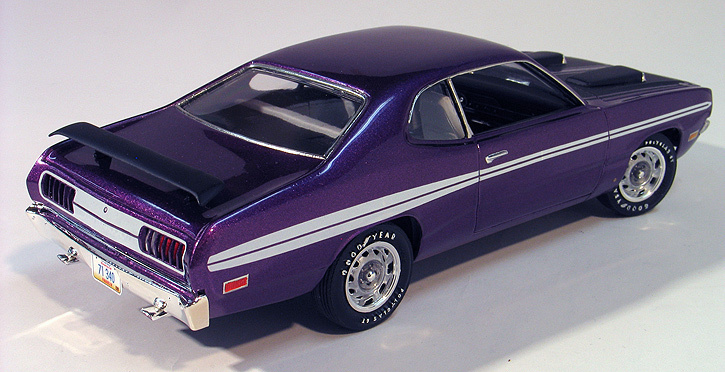 Unfortunately, the tooling was converted into the '75 Dart Sport kit long ago making the '71 Demon a rare and highly desirable kit. Thankfully though, there are several vendors re-popping the Demon in resin again for those of us who want to build one. 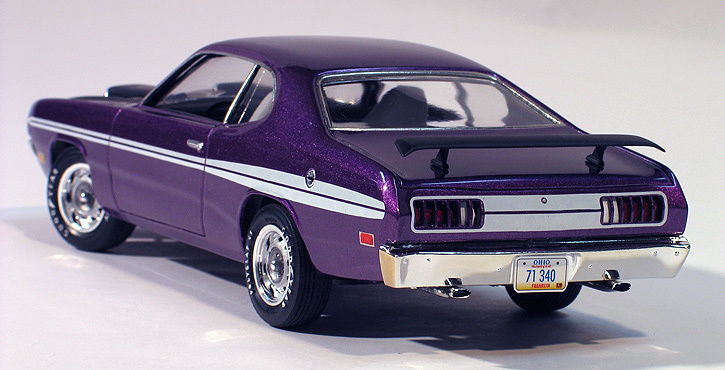 I built this Dodge Demon 340 using the Model King resin kit available from Model Roundup. It's a trans-kit which includes a body, the front bumper/grill and rear bumper. You supply the rest. This resin kit required more cleanup work than what you might need to build a Modelhaus kit and the bumpers come unplated, but the price was economical. My body came with a thin flashing in all the window openings that had to be removed. The casting was also thicker than a styrene plastic body so the inside needed to be thinned considerably, especially around the window openings and wheel wells in order for parts to fit right and for the body to have a proper in-scale look. A Dremel tool is a must have to build one of these kits. 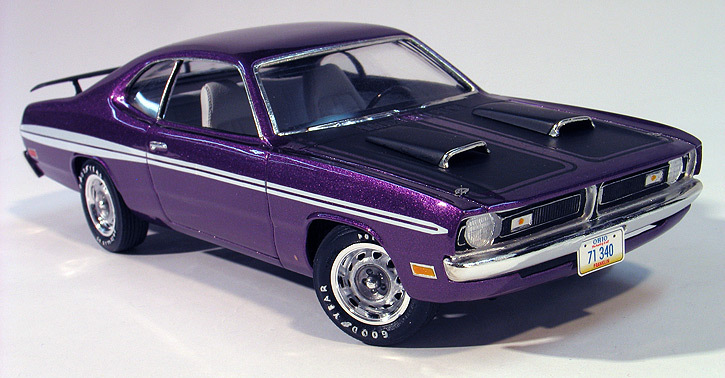 The real Dodge Demon and Plymouth Duster were built from the same platform and shared many parts. For the chassis and interior parts to complete my model I considered using both the MPC '75 Dart Sport and the newer issue AMT/Ertl '71 Duster kits. I test fitted both. The Dart Sport was a closer fit, but the Duster parts were a lot better detailed and they looked like they could fit with some minor trimming. I decided to use the Duster parts. After studying some reference pictures I noticed the Demon interior also had some slight visual differences than the Duster interior. I'm sure the Mopar purists will cringe, but I figured the Duster interior was close enough for a shelf model and the parts just looked much nicer. I used those as well. The Demon resin body comes with the hood molded shut and the twin hood scoops already molded to the hood. After reviewing reference photos it appeared to me that the scoops were positioned a little too far forward on the hood. Since they were also molded closed, I decided to remove them completely with a Dremel tool and replace them with the more accurate looking scoops from the Duster kit. After the resin body was cleaned up, I sent the bumpers off to Chrome-Tech USA for plating. Then I primed the body and shot it with Testor's Plum Crazy lacquer. Decals sets for the Demon are very hard to come by. Luckily, a fellow modeler I know, had one of the rare '71 Dodge Demon decal sheets from The Last Detail. He used the black stripes on a Demon model he built and I inherited the left over bits of his sheet which included the white stripes. After applying the decals and Bare Metal foil chrome, I clear coated the body with PPG urethane clear. After applying the clear, I masked the hood for the stripes using Bare Metal foil (this time as a masking material) and sprayed the stripes flat black. Bare Metal foil makes for an excellent masking material particularly when you need to mask something intricate such as the small pinstripes which border the hood stripes in this Demon. To finish off the hood detail I added a set of photo-etched hood pins which were a factory option. For the windows, I had planned to use the parts from the Duster. The front windshield was close, but needed some trimming in order to fit. In the process off trimming it, I accidentally broke it. So, I had to go to "plan B" and use the front windshield from the Dart Sport. The rear glass came from Duster. The side windows were made from clear sheet acetate. Although initially I thought using the Duster chassis would be a simple swap, especially since I was just building a curbside model, it turned out to be a little more challenging. I ending up have to do a lot of grinding and trimming on just about everything in order fit the chassis, interior, clear parts and body to come together right. I think it was worth it though as the Duster chassis looks much nicer and has the option of pose able steering. Final details included adding the optional factory rear wing which also came from Duster kit and my own custom made license plates.